When 49 people were killed this past summer at Pulse, a gay nightclub in Orlando, the theater world took action. OBIE (or Off-Broadway Theater Awards) award winner Caridad Svich created “After Orlando: An International Theatre Action” to explore the tragedy and issues surrounding it through art. The Phoenix edition of this international project will be under the direction and artistic guidance of Robert Harper, associate artistic director for Phoenix Theatre, and Micha Espinosa, associate professor of voice and acting in the School of Film, Dance and Theatre at Arizona State University’s Herberger Institute for Design and the Arts. “As an institute of higher education, ASU is committed to forging strong community ties that enhance our ability to understand, question or investigate a person’s sorrow, anger or hopes in response to current events, in this case the Orlando tragedy,” Espinosa said. The one-day theater event intends to provide a space where controversial topics, like gun control, can be facilitated through theater. “‘After Orlando’ directly aligns with our mission, which aims to create an exceptional theatrical experience by using the arts to articulate messages that inspire hope and understanding,” Harper said. The project will include the participation of more than 30 local artists and a keynote speech from State Rep.-Elect Daniel Hernandez, who gained national recognition for helping save the life of U.S. Rep. Gabby Giffords in 2011. “It is especially exciting to work with a professional theater company like Phoenix Theatre and many local artists I have come to respect over the years,” Espinosa said. "After Orlando" is scheduled for 6 p.m. Sunday, Jan. 29, in the Hormel Theatre at Phoenix Theatre. One ASU student and two influential Arizonans were selected as the 2017 Community Servant-Leadership awardees as a part of Arizona State University's 32nd annual Martin Luther King Jr. Celebration for their influential work in the community. The awardees were selected by the ASU MLK Jr. Committee for their servant leadership, for their philosophy of serving first, then leading as a way of expanding service. Contest participants were required to either create a poster illustrating their definition of leadership through service, or write an essay or poem about an individual who personifies that definition. This year’s theme is "Be the face of change." Poleviyuma, the Student Servant-Leadership awardee, is a community health student at ASU’s College of Nursing and Health Innovation. “The teachings of my grandpa and my mom instilled the values that I have that make me want to give back and contribute to the community,” she said. Inspired by her family, members of the Hopi tribe in northern Arizona’s Moenkopi village, Poleviyuma said she aims to use her research to affect policy. In accordance with the Native American values of community and selflessness, she hopes to make a difference in the community and expand communication and understanding across racial and ethnic barriers. “Even though we don’t have a lot of money and we’re from a place that doesn’t have a lot of resources, we still find ways to give back to each other,” Poleviyuma said. Although she is interested in addressing a wide variety of issues including environmental, government and health issues, she said she is especially focused on reducing the number of youth suicides on Native American reservations through culturally relevant preventative programming. In 2014, Poleviyuma worked with the Center for American Indian Resilience to conduct research for the Native American Cancer Prevention project, which explored the experiences of Native American cancer patients with health-care providers. She helped found Native Americans for Academics, Success and Unity, an ASU club meant to help Native American students reach their academic goals while engaging with the community. “That was a way to help with representation and give Native students here on campus a place to be and ways to give back,” she said. Poleviyuma also worked with the ASU Tribal Nations Tour to reach out to Native American students throughout the state and inspire these students to pursue a college degree upon completing high school. She said Martin Luther King Jr. stood up for people who couldn’t stand up for themselves, and she hopes to do the same. Poleviyuma says she leads by example to create greater understanding among different peoples, and in this way, hopes to show that these issues aren’t just Native American issues — they’re shared issues. Native Arizonans Lattie and Elva Coor, the Community Servant-Leadership awardees, have a rich tradition of giving back to the community in a variety of leadership roles. 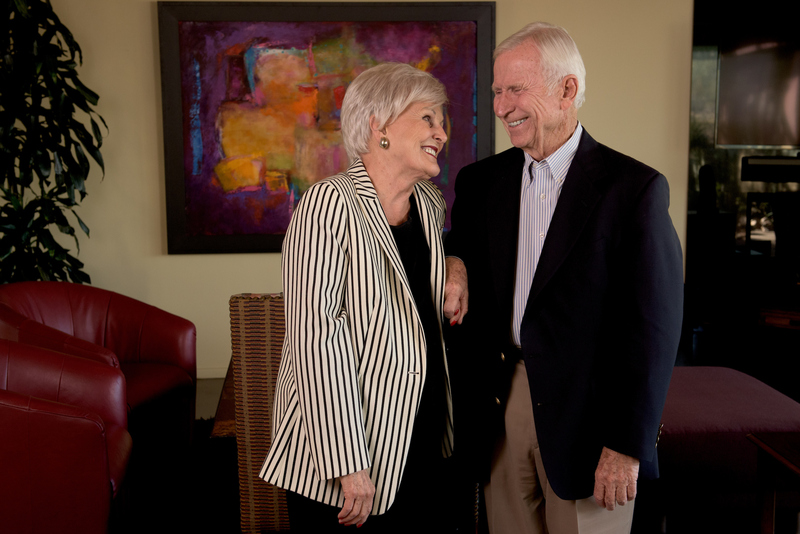 Lattie F. Coor is President-Emeritus and Ernest W. McFarland Arizona Heritage Chair in Leadership and Public Policy at ASU, and chairman and CEO of the Center for the Future of Arizona. “All of us have an opportunity to bring attention to these issues and then speak out on them,” he said. Growing up, Coor lived in a diverse area in Avondale, which inspired him to become a champion for equal access to education, regardless of socioeconomic or racial background. Throughout his adult life, Coor worked to make the equal opportunity he envisioned into a reality and has received many awards for his work thus far. For the past 26 years, he has served as a university president, first at the University of Vermont from 1976 to 1989, then at Arizona State University from 1990 to 2002. During his time at ASU, he hoped to make the university’s population reflect the diversity within the community. “There were major ways to change and shape it for the future, and it was that, above all, being in a university and being able to help it as it grew and developed, is what caused me to devote my whole career to that,” Coor said. In 2002, he founded the Center for the Future of Arizona, a nonprofit, nonpartisan organization designed to research and act upon issues relating to the state’s economy, quality of life and civic health. One of the organization’s main focuses is education, and includes a program called SpeakOut AZ that was designed to increase civic participation throughout Arizona and include civics curriculum in schools. SpeakOut AZ was created by Coor’s wife and co-awardee, Elva Coor, who has held roles in government and political activities at the local, state and national level, as she seeks to increase community participation in government. Elva Coor also founded a business, which she managed for 20 years, and the Arizona chapter of the National Association of Business Women. In addition to founding the President’s Community Enrichment Programs at ASU, which aims to unite the university with its surrounding community, Elva Coor has also served on boards and volunteered with many organizations. She also co-founded Building Great Communities, and founded an organization meant to increase the graduation rate of African-American students at ASU. She said her years of working in the political arena, business, academia and nonprofits led her to value a well-informed and engaged electorate. For more information about the 2017 MLK Jr. Committee and events celebrating Dr. King’s legacy, go to asu.edu/mlk.